Italy is the journey of a lifetime! Motivated by our intimate knowledge and affection for our country, Tips 4 Italian Trips invites you to the ultimate travel experience, the farthest as possible from mass tourism. We are Italian, living in Milan and we are a family. No one knows – better than us – your needs and how you can travel through Italy. With our expertise, exclusive deals and extensive travel experience (in Italy and abroad), we aim to create the journey of a lifetime. Before beginning to plan your Italy trip, read the five reasons to visit Italy with kids and choose what attract you the most. Think about what to expect from an Italy custom vacation, and get in touch with us. We have been travelling together in Italy and abroad for more than 15 years, and before we met in 2003, we were independent solo travellers. Travel is the passion that made us a couple and then a family. This is the reason why we can’t wait to put together the perfect customised Italy tour for you. We are specialised in travel within the Alps, the Dolomites and most of Northern and Central Italy, but we have travelled a lot throughout the country and we have a network of travel experts in the Southern region that can give us local tips and suggestions. Whether you’re travelling with babies, with toddlers and children in tow, we’ll create a custom trip that perfectly suits both your interests and your budget. We offer three different types of support, according to your preferences, budget and how much time you do have to plan your trip to Italy. Think about what your needs are. Maybe you’re just overwhelmed by all the options? No worries. We are here to help you realise your bucket list trip! 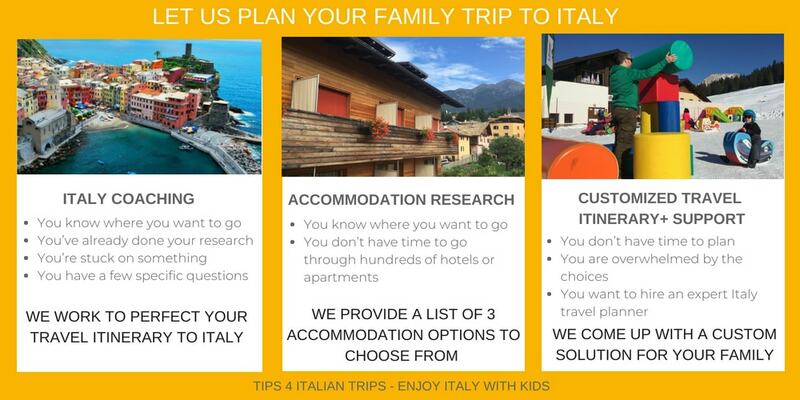 Thanks to Tips 4 Italian Trips travel designer service, all you need to do is sit back while we do all the planning. You just need to get in touch, fill the form below and prepare your luggage! We will always do our best to design the best trip possible for you and your family. If at any moment we should feel that we are not the right person to create your journey to Italy, we’ll let you know and will refund your money. We will always provide honest, unbiased and researched advice to ensure you have the journey of a lifetime. Please note that we are providing a consultation service; all bookings, including travel, accommodations, and restaurants, are your responsibility. Be aware that we do not accept liability for any losses, injuries, or damages incurred while following a custom itinerary signed by Tips 4 Italian Trips.